On May 21-26, 2018 scholars of the 2nd Fulbright Arctic Initiative Program came together in Canada, including both Russian scholars who participate in the program this year: Elena Gladun, Candidate of Law, Associate Professor of the Institute of State and Law of the Tyumen University, and Svetlana Tulaeva, Candidate of Social Sciences and Associate Professor of the North-West Institute of Management of RANEPA). On the first day of the program in Ottawa the participants met with Canadian authorities in charge of the Arctic indigenous peoples affairs. The meeting focused on matters regarding the Arctic Council's work, improvement of economic and social aspects of the indigenous peoples' lives and development of effective management in the region. Also, the new Fulbrighters met with professors of the University of Ottawa and discussed their research on the topic. The next four days were spent in Iqaluit, the capital of the Canadian territory of Nunavut. Major part of its population is Inuit. Residents of Iqaluit, like many other settlements in the Arctic zone, are forced to deal with such problems as adapting to climate change, social infrastructure develoment and combining traditional indigenous practices with modern industrial development. In Iqaluit, the scholars met with representatives of the Inuit autonomy, attended the meeting of the Assembly of First Nations, discussed the aspects of sustainable development of the indigenous population with representatives of the Inuit Circumpolar Council, and visited the local school. 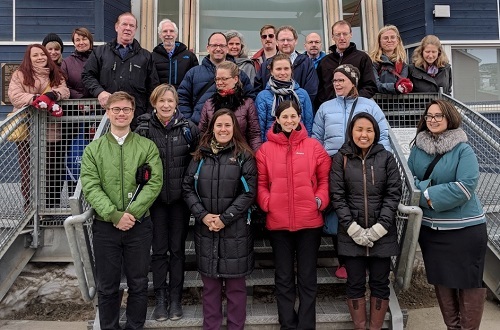 Getting familiar with Iqaluit's life is expected to assist the Fulbright scholars with elaborating their research projects which are aimed at adaptation of local communities and eastablishing a sustainable economy in the Arctic zone. The Fulbright Arctic Initiative Program proved quite popular among applicants from all over Russia. In addition to that, projects that are in any way focused on development of the Arctic region can also be considered for the Fulbright Visiting Scholar Program applications.